“The scissor scores the cardboard, and the wrapping is ripped off. Now StingRay comes out of her crispy nest of tissue paper and is pulled into the bright light of what she knows, just knows somehow, is a kitchen. White cabinets. A jar of spoons and spatulas. Finger paintings stuck to the fridge with magnets. Tomorrow morning over at Kirkus, I’ll have a Q & A with author Catherynne M. Valente about The Girl Who Circumnavigated Fairyland in a Ship of Her Own Making, one of this year’s most talked-about children’s novels. Two local friends and fellow children’s lit aficionados joined me on this interview. (The questions they contributed are way better than anything I could ever conjure up.) An abbreviated version goes up at Kirkus tomorrow, and next week at 7-Imp, I’ll have the interview in its entirety — along with some of the book’s illustrations from Ana Juan. If you missed last week’s column, I wrote about Emily Jenkins’ latest set of stories about StingRay, Lumphy, and Plastic — Toys Come Home: Being the Early Experiences of an Intelligent Stingray, a Brave Buffalo, and a Brand-New Someone Called Plastic, released by Schwartz & Wade this month. That column is here. Opening this post is an illustration from the book from Paul O. Zelinsky (who visited me for breakfast in 2008 with one of my favorite breakfast interview photos EVER). 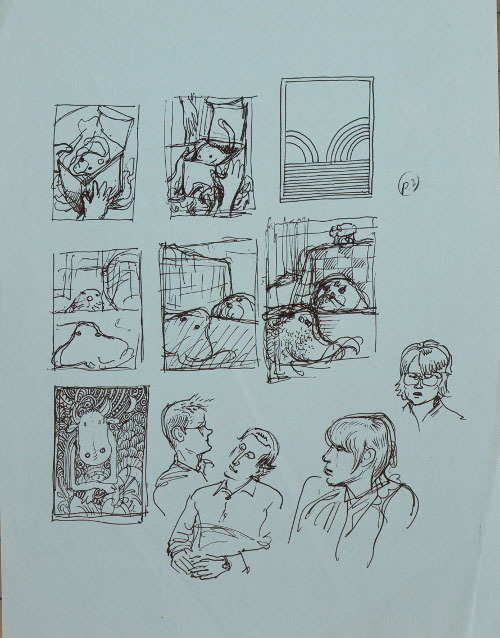 Paul is also sharing one more image below, a sketch page showing possible images for Toys Come Home, which he submitted to The American Booksellers Foundation for Free Expression’s online children’s book auction. This is an auction of children’s art that culminates during Banned Books Week (September 24 to October 1). 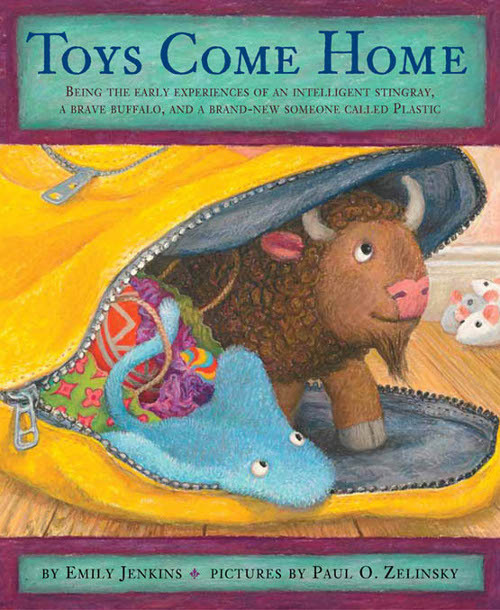 TOYS COME HOME: BEING THE EARLY EXPERIENCES OF AN INTELLIGENT STINGRAY, A BRAVE BUFFALO, AND A BRAND-NEW SOMEONE CALLED PLASTIC. Copyright © 2011 by Emily Jenkins. Illustrations © 2011 by Paul O. Zelinsky. Published by Schwartz & Wade Books, New York. Images reproduced by permission of Paul O. Zelinsky. I really dig the Toys series. 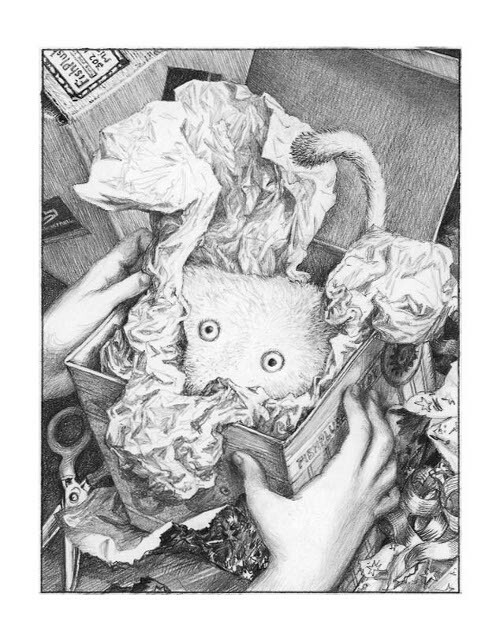 Jenkins is a gem, and Zelinsky’s illustrations – which I’ve always liked, here and in other words – make me grin.